August 16-18, 2018 | Colorado's Must-Attend Family Law Event! Join Colorado's Family Law Judges, Attorneys, Accountants, and Mental Health Professionals at Colorado's Premier Family Law Conference! CBA-CLE has recently learned that the Town of Vail is hosting the Colorado Classic Bicycle Race, Stages 1-2, on August 16 - 17, which just happens to fall at the exact same time as the Family Law Institute. Unfortunately, on August 16th, the entire Town of Vail will be inaccessible to all vehicles between the hours of 9am and 3pm. The Pre-Conference Trial Practicum was scheduled to begin at 1:00pm on August 16th. However, due to the road and parking garage closures, and overall inaccessibility of the town, WE HAVE DECIDED TO POSTPONE THE START TIME of BOTH the TRIAL PRACTICUM AND the WELCOME RECEPTION. If you are attending the Pre-Trial Practicum and will be driving to Vail on Thursday, we do not recommend arriving before 3:15pm. If you have a hotel reservation at the Marriott and would prefer to arrive on Wednesday, please let us know. We will connect you with the Marriott to extend your reservation beginning on Wednesday, August 15. Due to the shift in schedule (see below), dinner will be provided for Pre-Trial Practicum participants. If you have a reservation for Thursday night, but are not attending the Practicum, you can still plan to arrive after the standard 4:00pm check-in time with only slight delays. If you plan to drive to Vail on Friday, August 17th, the Institute begins at 8:00am. If you will be arriving at the start of the Institute on Friday, you should be able to access the Lionshead parking structure (day time hours are free) but parking will be extremely limited and the Town of Vail expects the garages to fill up before 9am. Valet parking at the Marriott will still be available for all participants. The valet rate is $20/day per vehicle. Please note that the race and multiple road closures will still be in effect on Friday from 9:00 am - 3:00 pm. While Lionshead Village is not included on the list of affected areas for August 17th, we anticipate that there will still be some residual effects from the other closures. For detailed road closure information, please visit https://www.vailgov.com/road-closures. We sincerely apologize for this inconvenience. The Marriott Hotel and all other properties in Vail are being affected by the bike race and Town of Vail road closures. Please contact us at (303) 860-0608 to let us know if you have any questions or concerns. Colorado's Must-Attend Family Law Event! 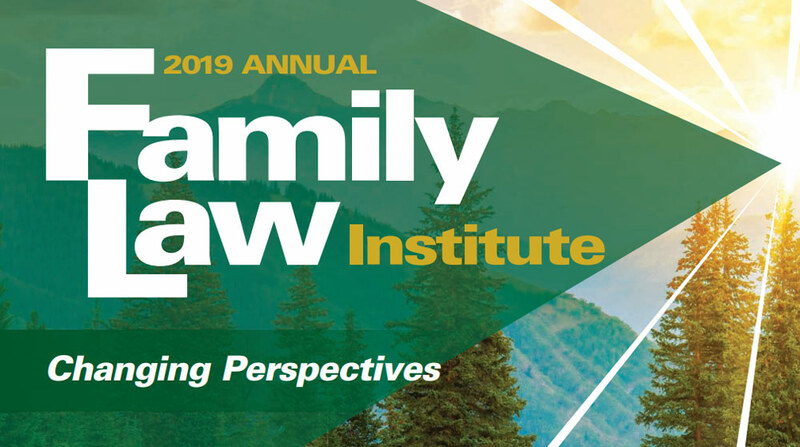 The Institute has become the annual gathering place for the Colorado family law community. Talk with past Institute Chairs, Family Law Section Council members present and past, and listen to some of the most knowledgeable and experienced family law practitioners, judicial officers, accountants and mental health professionals in the region, who will come prepared to give you the strategies and information most relevant to your work. See old friends … make new connections … this is one Institute you can’t miss! ■ Have a question about the conference? Just ask!